I bought a Sealy memory foam mattress back in April. I took of the cover off to wash it. It ended up ripping so I decided to put a fitted sheet on the matress with out it. I found out that night that it has a fiberglass lining! My clothes and pillow and blankets were full of fiberglass! I bought a new waterproof cover and threw away everything that came in contact with the fiber glass. I put the original ripped cover back on with the new waterproof matress cover. I feel uneasy knowing my bed was exposed to fiberglass. I’m not familiar with Sealy using fiberglass as part of their FR barrier. What model mattress did you purchase? Did you contact Sealy with any of this information, and if so what was their reply? Please let me know, as I would be interested in your mattress model. i bought my king matress from the sears outlets its a 10 inch memory foam with a 2 inch gel top that comes in a box im not really sure about the model so sorry! Liz, our mattresses are not designed to be used without the cover. Please contact the store you purchased from, they may be able to assist with a warranty claim. There will be a law tag sewn into the covering of the product, usually at the head of the mattress. As you’re making a claim of the product using a certain type of FR material, it would be beneficial to know the exact name of the mattress itself. While warranties come from the manufacturer, they usually require you to go through the retailer where you purchased the product to file such a claim. I’m not aware of the model which you have, and it may not even have a cover than was intended to be washed, so it may be something that has voided your warranty by washing it and ripping it. Was this a new product? 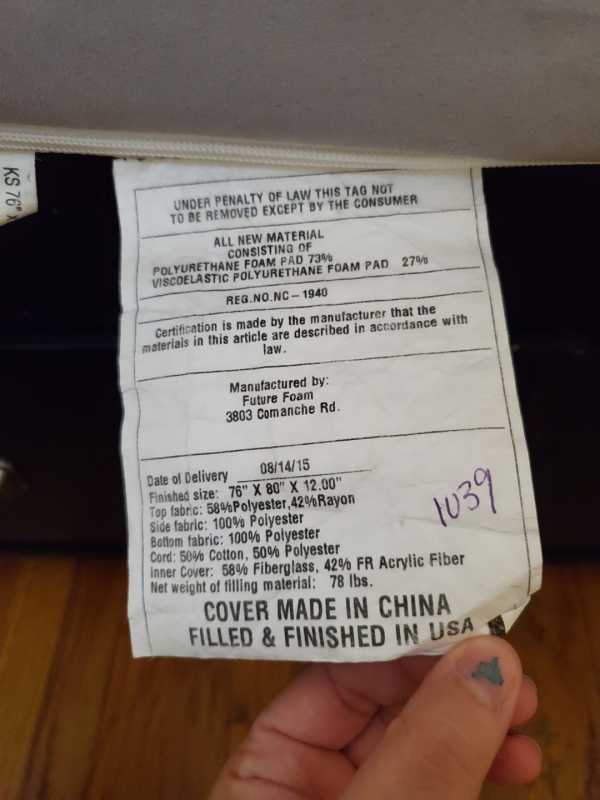 We have an issue with our Foam Mattress cover made out of Fiberglass which the label never stated the cover couldn't be remove to be wash and the mattress even has a zipper for the cover to be removed. My son was very sick and vomited on the mattress, we removed the cover and wash it now our house is infested with fiberglass. We are in the process of throwing away clothes, shoes, blankets, towels, curtains, everything. We bought a cover for the mattress and the problem persisted, so have to throw away the mattress, washer and dryer. We have been suffering from sore throats and allergies we think is from sleeping on a mattress full of fiberglass. The company said that they could replace the mattress and compensate us with $250, which is not even close to how much we will end up spending to replace everything, they said because we weren't the original purchaser and that will fall out of there warranty. The mattress was purchased 8/2015 and we bought all the furniture from this young couple literally brand new 11/2015. We are on a total lost right now and don't know what to do. It will be very hard on us financially not to mention the physical and emotional problem this has cause my family. The itching from the fiberglass is unbearable. The company's name is Future Foam they are here in the US. Anyone else with the same issue? What can I do? Any good cleaning products to clean the house? ... I am sorry about all the issues you are having with the fiberglass particles released through washing the cover of your second-hand mattress. 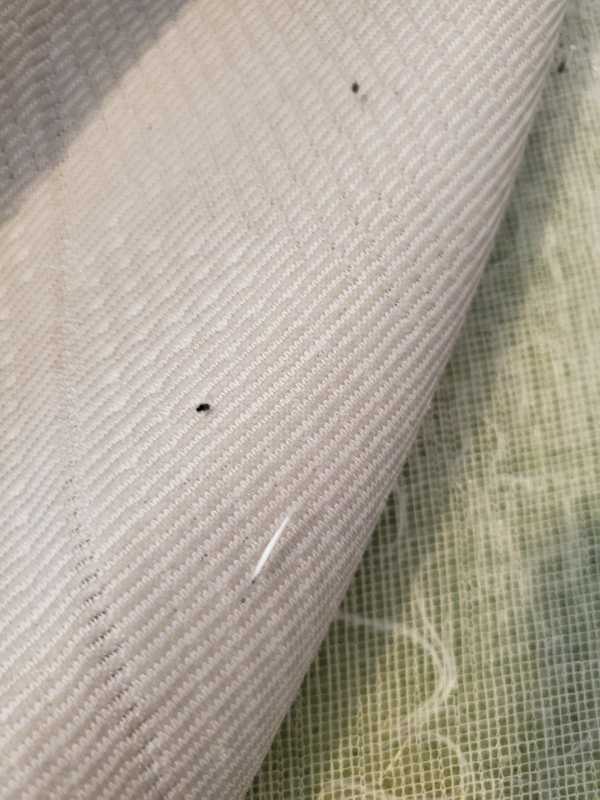 It looks like the fiberglass is coming from your Fire Retardant barrier which was broken down when you machine washed your cover The cover seems to be defective since you shouldn't be seeing glass particles migrating out of the fire barrier. Something like this can indeed can be very disruptive and major emotional stress, not to mention ... the financial stress. I hope you can do some less costly damage control to remove the fiberglass particles that spread throughout your home. At this stage it may be a little extreme replace the appliances in your home, I'd certainly try to use any means to thoroughly clean up the appliances and surroundings, replace the filter in your drier, use a vacuum filter with a HEPA filter and perhaps add a mattress bed bug cover with a waterproof membrane that would keep "insulate" you from the fiberglass particles that may still be in your mattress after the cleaning it. The “fiberglass” content in the label shows 58% of the inner FR mattresses cover. Both outer and inner covers are made in China. It is great that you contacted “the company”, which I assume is Future Foam, and it is good they offered to replace the mattress and offered some cash. To their credit, they are willing to meet you in the middle as it is very unusual to replace or refund products for second-hand buyers. I have to say I am surprised they offered this. As an aside, this is a typical example of some unintended consequences ... the USA is passing Fire Retardent laws to “keep people safer” but some of the chemicals companies use to “pass” these regulations are not so good. Figure it out! To clean fiberglass dust and debris from surfaces, use wet mops and cloths, or a vacuum cleaner equipped with a HEPA filter. Do not dry sweep or perform other activities that may stir up dust. Did you see any skin irritation? ... this is the most commonly described problem from fiberglass allergies. Have you had issues with fiberglass allergy in the past? Did Future Foam say if they are no longer using fiberglass in a new mattress replacement they offered to send? I look forward to any updates or solutions that worked for you to clean the fiberglass dust .. also let us know what you decided to do about your current mattress. I appreciate you sharing this on our forum and raising consumers awareness on checking the law tags. Last edit: 13 Apr 2019 18:47 by Phoenix.